Today, it's hard for most North Americans to contemplate having a family Christmas without a Christmas tree somewhere. So it may be hard to believe that Christians got along for over 1400 years without using evergreens to celebrate the birth of Jesus. Or that the use of evergreens in midwinter feasts started long before there was Christmas. How a pre-Christian midwinter decoration became one of the most beloved symbols of Christmas is an odd, but fascinating story. Pre-Christian History - Historically, we know that many religions celebrated midwinter feasts long before the birth of Jesus. As the shortest day of the year, the solstice was a sort of milepost - a sign that things were bound to get warmer and brighter eventually. To celebrate the coming "rebirth" of nature, several pre-Christian cultures brought evergreen plants like fir, holly, and mistletoe indoors to give a "springlike" atmosphere to their homes. Jesus Is Born, about 6 BC. By AD 200, the story of Jesus' birth, life, death, and resurrection had been spread over much of the known world. Still, most Christians did not celebrate the birth of Jesus as separate feast day for centuries. For one thing, nobody really knew when Jesus was born (although they knew the anniversary of His death and resurrection, so Easter was celebrated almost from the beginning). Eventually the established church gave up trying to keep their Roman converts from joining in non-Christian midwinter feasts such as Saturnalia. They decided to celebrate the birth of Jesus on the winter solstice (or as close as they could come with their ancient calendars). Christmas eventually emerged as an important Christian Holy Day, second only to Easter. Still, it was well over a thousand years before most Christians began to use evergreens in their Christmas celebrations. Christmas Trees Emerge - The great reformer Martin Luther (1483-1546) is often credited with reintroducing evergreen boughs to midwinter celebrations in Germany, although there are few historical records of Christmas trees as we know them before 1600. Christmas boughs and trees soon spread over Germany. In subsequent centuries, as Germans emigrated by the hundreds of thousands to the New World. they brought their tradition of Christmas greenery with them. English Speaking Cultures Were Slower to Adopt - In England, the Puritains had disliked and even outlawed many Christmas traditions. That may help explain why the Christmas tree was slower to catch on in England and parts of North America. As late as the mid 1800s, very few American homes had Christmas trees, although evergreen boughs were occasionally used to brighten midwinter feasts. 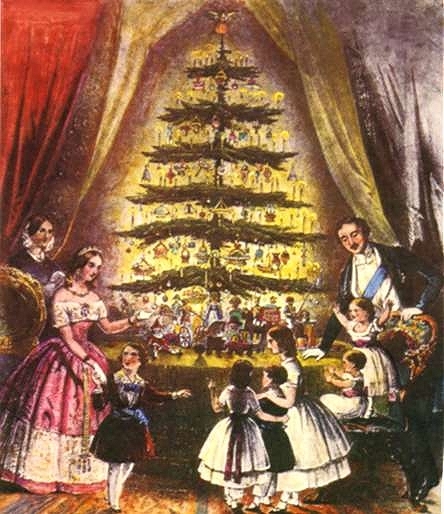 The German-born husband of England's Queen Victoria did give Christmas trees a boost in 1841, when he set up the a Christmas tree in Windsor Castle. Pictures of the royal family around their Christmas tree were published in newspapers in England and North America, boosting the trees' popularity even further. During the same period, Christmas celebrations in North America and England were gradually focusing more on the family than they had before, in part due to the growing popularity of the poem we call "The Night Before Christmas" and of the Dickens story A Christmas Carol. 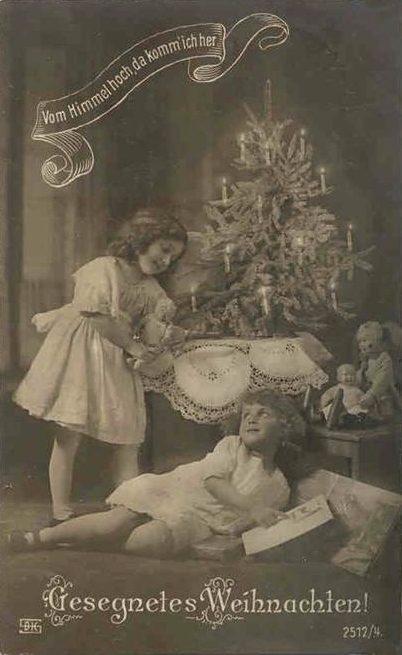 By the time those works were written, secular Christmas celebrations had largely become excuses for adults to get together for drinking parties. But during the mid 1800s, English-speaking cultures were shifting to recognize Christmas as a family holiday. 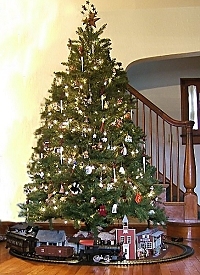 Household expressions of Christmas cheer, such as the Christmas tree, became more popular. Christmas Trees Grew in Popularity, Size, and Ornamentation - The first president reported to bring a Christmas tree into the White House was Franklin Pierce, in 1853. During the late 1800s, Christmas trees grew rapidly, not only in popularity, but also in size - from being a 2-3' tabletop tree to being the 5'-8' trees we are used to today. The kind and amount of decorations also increased. Originally evergreen boughs and Christmas trees were decorated sparsely, usually with candles only, or maybe with apples or other edible treats. In the late 1800s, blown glass balls from Germany began to find their way to American Christmas trees. Then the blown glass ornaments increased in variety, and many other kinds of ornamentation emerged. By 1900, real feathers and pine cones had been joined by crocheted ornaments, ornaments made of folded wax paper, artificial birds and butterflies, and real flowers. By 1910, glass ornaments shaped like pine cones were a popular theme. Still, for a long time most Christmas trees were decorated with a dozen or two ornaments at the most - it's only been in the last few decades that families seem to try to hang one ornament on every branch. The Christmas Tree Industry Emerged - By 1901, so many Christmas trees were being harvested that President Theodore Roosevelt feared that the North American forests were being destroyed. One account says that Roosevelt refused to have a Christmas tree in the White House, but his children smuggled one in anyway and hid it in a closet. According to the story, Roosevelt's friend, conservationist Gifford Pinchot, convinced him that Christmas tree harvesting was not nearly as dangerous to the forests as Roosevelt feared. That same year, the first Christmas tree farm was started, to the praise of Christmas tree lovers and conservationists alike. Almost all of the millions of cut trees used in North America ever year are now grown on these farms. By that time, companies such as Sears Roebuck were offering artificial Christmas trees as well. 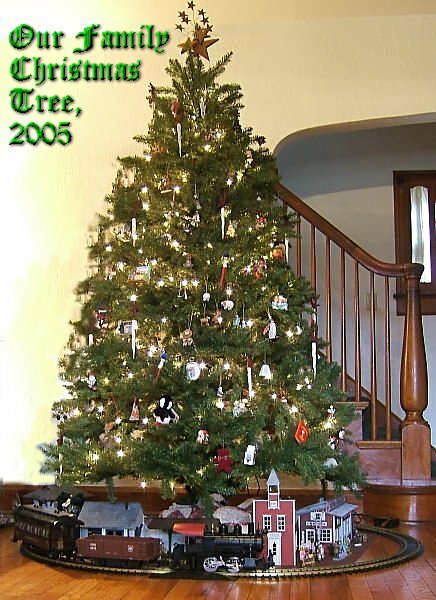 Most artificial trees at the time consisted of a dowels joined to a central trunk (something like the aluminum Christmas trees of the 1950s but with short green "needles"). Small artificial trees made of feathers dyed green were also popular. Still, it wasn't until the advent of vinyl and modern plastics that artificial christmas trees began to be remotely "convincing." Christmas Trees in the Past Century - By the early 1900s, the Christmas tree had become an important symbol of Christmas, and few homes were without one. Real candles had been replaced by electric lights, which, unfortunately, were still dangerous once the tree dried out. And trees dried out fast in coal-heated homes. That didn't keep folks from trying to extend the useful life of their Christmas trees, though. 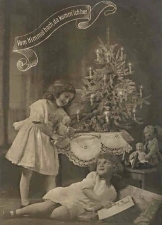 Before 1900, it was common for the Christmas tree to go up on Christmas Eve, after the children were in bed, and to come down on or before New Year's Day. But as the tree continuously became a more important part of Christmas, it started appearing earlier and earlier. Families who liked to set their Nativity scenes or electric trains under the trees could hardly be expected to wait until Christmas eve to enjoy such activities. So it became more common for the tree to go up in mid-December and to come down only after becoming an eyesore and serious fire hazard. Nowadays, most cut Christmas trees reach the consumer in far fresher condition than they used to. Today's miniature lights are much safer, too, so the fire risk isn't as great (although you should still unplug the lights when you're not going to be in the room for a while). A family that starts a cut tree out right and waters it consistently may get three good weeks out of it before it starts looking "thin." Of course, artificial trees are getting better and better looking, so that folks who want to get more than three weeks' use out of their trees, are making that choice. Is the Christmas Tree a Christian Symbol? - It certainly didn't start out that way. As mentioned before, evergreens were used in midwinter celebrations by several pre-Christian European cultures. If the church of the "Dark Ages" hadn't decided to start celebrating Christmas around the date of those pagan mid-winter feasts, we probably wouldn't even have Christmas trees today. And there's certainly no guarantee that people who use and love Christmas trees have any interest in the Person for whom Christmas is named. Yet for most families, a Christmas tree is at least a symbol of family, of memories of good times past, and in some ways, of hope for the future. To me, if a Christmas tree puts someone in the mood to sing about the birth of Jesus, that can't be all bad. In our house we have a big Christmas tree covered with ornaments from every year of our marriage, and several smaller "theme" trees that brighten up the house between Thanksgiving and New Years' every year. (I admit that most them are artificial, and some years all of them are.) We do hope that you dearly enjoy your own Christmas tree (or trees) this year. And that you'll contact us with any questions, additions, corrections, or suggestions on how to improve this site. Whether you're reading this a week or eleven months before Christmas, please have a great family Christmas this year, and let us know what we can do to help. What About Living Christmas Trees? To return to the About Christmas Trees page, click here.